Even though spring has officially turned to summer, it is still a terribly annoying time for weather forecasts. Between dealing with the possibility of rain, temperamental temperatures, and blustery days of endless humidity, planning accordingly is no less difficult than it was two months ago. Even 21st century technology and up-to-date predictions aren't always reliable, since weather prediction isn't ever very reliable. Instead of refreshing your app, maybe it’s better to simply look around. Here are some old school techniques for anticipating Mother Nature's plans. Count the number of cricket chirps in 14 seconds, and add 40 to the total number and you’ll get a close estimate of the temperature on the ground in degrees Fahrenheit. This is based on Dolbear’s Law and works best with snowy tree crickets, so get to know your local insects before trying this one. 2. Frogs are more vocal too. Well, not actually more vocal. These amphibians just get a whole lot louder when stormy weather is on the way. If you start noticing croaks, you might want to get your umbrella ready. 3. Trust that old adage. "Red sky at night, sailor’s delight. Red sky in morning, sailors take warning," is actually fairly reliable, at least in places where weather systems come out of the west. The effect is caused by low angle light shining on dirt and particles trapped by high barometric pressure. High pressure occurs when the air mass is being pushed down so it's hard for clouds to form, while low pressure allows the air mass to expand and clouds to form more easily. So, a red sunset usually means that the cloud-free high pressure system is coming toward you, while a red sunrise means the high pressure system has already passed and the rain is coming. If you need even more evidence in support of this one, the concept of "red sky at night" first appeared in the Gospel of Matthew. Like we said, old school. 4. Remember that other saying, too. As it goes, "When a halo rings the moon or sun, rain is approaching on the run." This rhyming phrase might not be as familiar to you, but it’s just as accurate. A halo will form around the sun or moon when ice crystals high up refract the light. They're a sign that the weather is going to change and most likely bring rain. 5. Look to the cattle. This one might be less reliable than the other fauna forecasters, but farmers often say that their cows huddle together to seek comfort before a storm because they can sense low pressure systems. They’ll also lie down or seek lower elevations to keep dry and protected. Anyone with pets can attest: sometimes the animals know things we do not. Sheep are said to do this too, so if you live on a farm, you should be set for animal weather detection. 6. Look to the sky. For the birds, that is. After all, they have the best vantage point (and something called the paratympanic organ, that acts as a barometer). When birds are soaring high in the sky, the skies are probably fair, whereas in storm systems, the falling pressure in the air is the source of fowl discomfort. A crowded phone line is a good place to look if birds are staying low to the ground. If you’re seaside, keep an eye out for the seagulls. They're rarely seen standing around or walking unless the weather out on the water is bad. 7. Bees and butterflies know too. If a storm’s coming, you’ll know by the absence of these flower bed regulars. According to beekeepers, hives get awfully cozy right before it rains as the bees take shelter. Like the birds, these insects can sense the change in air pressure and will come in for a landing. 8. Learn even more proverbs! The Farmer’s Almanac is the best source for all the weather proverbs you can handle, but the fact is, they usually exist because they work. "Wind from the south brings rain in its mouth" is another truism, while northern winds usually mean clear skies. There's also the well-known "calm before the storm," which means if gusts turn to stillness, something bad is about to hit. Everyone knows clouds carry weather, but there are nuances in cloud formations that can be really telling if you know how to read them. The fluffy, white cartoon clouds are good news, and the higher the better. Storm clouds, aside from being dark and ominous, usually mean rain when clustered together. Low pressure and high humidity allow fragrances to escape, which means things like the scent of tulips or grass will be stronger when it’s about to rain (sorry, city dwellers). 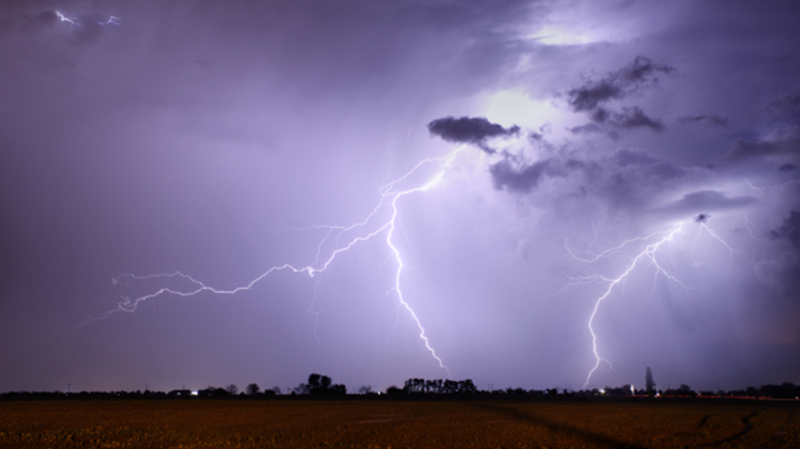 But, even if you do live in an urban area, you might notice a scent of ozone in the air—lightening causes ozone to form and the storm's downdrafts bring that smell to nose level. 11. Hug a tree, and take a closer look while you’re at it. A pine cone will close up as the humidity increases to protect its seeds from getting drenched in the oncoming rain. When it’s dry out, they open back up again for the wind to carry them off. The drier and lighter they are, the farther the seeds will go. 12. Watch for smoke signals. This is a good one to know if you’re camping. Smoke should rise steadily and straight up as opposed to hanging near the ground or swirling. A drifting stream of smoke suggests low pressure, and that means rain. 13. Take a look in the mirror. This surely isn't news for anyone with humid-sensitive locks, but when it curls up or frizzes out, bring an umbrella (and maybe also your bad-hair hat) to work that day. 14. Scoop up a wooly bear caterpillar. Legend has it that the wider the middle brown section is on a wooly bear caterpillar, the milder the winter (and vice versa). While most scientists say this method is bogus, there’s still a Wooly Worm Festival in North Carolina every October during which a winter weather forecast is determined, and I think we can all agree that’s an excellent tradition that should continue to fly in the face of science. 15. When all else fails, grab a persimmon seed, pig spleen, or goose bone! According to The Farmer’s Almanac, you can cut open a persimmon seed and look to the kernel for some wisdom about what the winter weather is doing. If a pig spleen is more readily available, there's a couple tried and true methods to predict the temperature or the precipitation by examining a hog's organ. Finally, the breastbone from a goose can, in time, tell you what kind of winter it will be depending on its coloration. As one might suspect, the darker the color, the worse the weather.